Ordering a gown online can be intimidating. We want your Elizabeth Cooper Design order to go as smoothly as possible- every bride deserves to find the modest wedding dress of her dreams without it being a painful ordeal! Should you have any questions at all please e-mail hello@elizabethcooperdesign.com at any time for assistance with your order. If you are uncertain which size option would work best for you we would be glad to lend our professional expertise. - Turnaround time for all online gown orders is about 8-12 weeks (depending on the time of year) from order date to arrival at your door. Should you need a rush order please e-mail us at hello@elizabethcooperdesign.com. - Please review our return policy here. - Please see below for details about how to obtain your measurements. Keep in mind, if you are on the border between sizes it is usually best to order a gown a tad too larger versus a tad too small, as it is always easier for a seamstress to alter a gown down in size. Before ordering your gown you should take your measurements to assure you have the correct size for your body shape. Take a measuring tape and measure around the largest part of your bust. With your measuring tape measure around the smallest part of your waist. This should be in-between the bottom of your ribcage and the top of your hip bones. Using your measuring tape measure around the largest part of your hips and bum. ​It is important to keep in mind the style of your gown while you are ordering. If you are ordering a form fitting gown then the most important measurement to consider is the hip measurement- this is because if the hip measurement is too small then the gown will not go on. If you are ordering an a-line or ball gown style gown then the hip measurement becomes less important and the measurements you will want to focus on are bust and waist. Often brides find that they can go down a dress size when ordering a gown of this style. - Your gown may be wrinkly from shipping, the best way to smooth your gown is to steam it. Ironing your gown is risky and could result in the fragile bridal fabrics being melted or damaged. If you don't have a steamer we recommend a Conair Extreme Steam Fabric Steamer, which can be purchased at most stores (Target, Walmart, etc) for around $30-$40. Be sure to steam each individual layer for the best, smoothest look. - Try on your gown. The best way to put on your gown is to STEP INTO IT, feet first, Do not pull the down over your head, if it can be avoided. Not only does this increase the chance of getting make-up on your gown, it also causes the internal lining of the gown to bunch up and not lay nicely. Shoes should be put on after the gown is on. Please keep in mind that all Elizabeth Cooper Design gowns are designed to be worn without a bra. Some brides like the extra padding and support provided by a bra, however it is best to experiment with wearing the gown with and without a bra to see which achieves the smoothest look through the bust. - Your gown will not look nice if it is not done up properly. Get someone you know to lace up your gown for you. Lacing should start at the top of the gown, criss-cross, every row, all the way down to the bottom. Be sure to have the lacer tighten each new row as they lace, to assure the best fit. They will also need to smooth and tuck the underlying panel as they lace. Once they reach the bottom they should reach their hand up the back of the skirt, grab the excess laces and pull them down into the dress. After the excess laces are inside the back of the gown they should be tied into a knot to secure the corset as well as to keep the excess laces from being stepped on. - If something doesn't feel quite right: perhaps the sleeves are too tight, or the bust is too loose, it is important to keep in mind that almost anything can be easily fixed with an alteration. Often when brides find that the sleeves feel too tight they feel that the solution is to go up a gown size, this is usually not the case. Going up a gown size will often result in an ill-fitting gown. The easier way to fix this issue is to have the sleeves loosened by a professional seamstress. 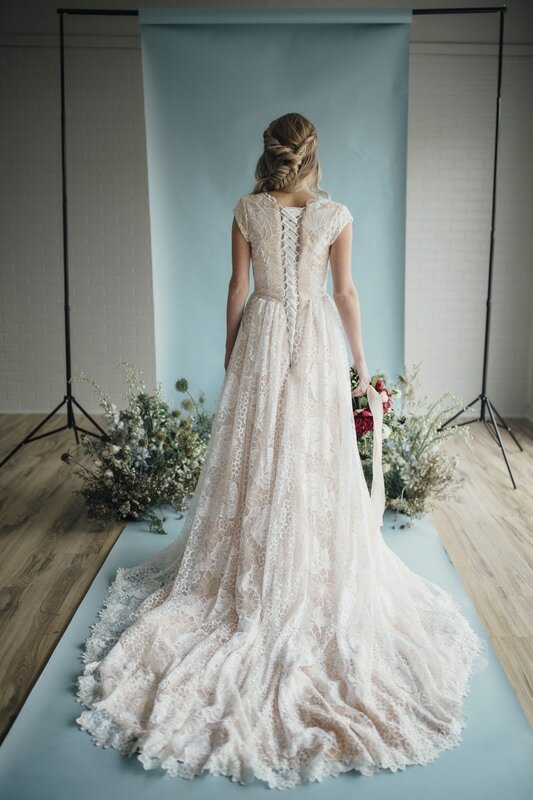 Common alterations include: bringing in the gown, taking out the gown, hemming the gown, loosening/tightening the sleeves, changing the neckline, changing the sleeve length, adding length to the gown, lining the sleeves, taking out the lining of the sleeves, bustling your gown, etc. Almost any imperfection in your gown can be fixed with a quick alteration. - If you have any questions regarding your gown please e-mail us at hello@elizabethcooperdesign.com and we would be glad to assist you.